Out of ignorance comes innovation. Or at least the chance to re-invent the wheel. Back at my lofting board, I had banished my cheap plastic spirit level to an out-of-favor position on a lower shelf in my 'work shop'. However, I still hadn't lost my faith in gravity. If my spirit level couldn't handle the simple job of drawing a vertical line, I had an even simpler tool that could. With a 1/2 oz. sinker and some fishing line, plus the dim memory of how to tie a fisherman's knot, I 'built' a plumb-bob. When I'd done that, I hammered a small nail near the top-middle of my lofting board, and hung my new plumb-bob on the nail. Instant vertical line. Then I used a trick found in every boat building book. Under the fishing line, I made a small mark with my pencil every 2 inches. Then I removed the plumb-bob and used a straight edge to connect the dots. That was my Station 3. If you have a line AB, and draw two arcs (red) AC & BD (AC=BD) and then draw a line (blue) at the points of intersection E & F, then you have a perfect perpendicular. All you need is a bit of wood (I got fancy and used oak). Drill a few pencil-sized holes along one end, and bang a nail into the other. Then you can cut off the end of a pencil and press-fit it into any of the holes. That's all there is to it. press the pencil into the #1 hole on the beam compass (shown above). This makes the shortest arc possible. swing the compass and draw two small arcs that cross the Station 3 line -- one above the LWL mark (A), and one below the LWL mark (B). connect E and F with a straight edge, an you have a perfectly perpendicular L.W.L. line. Again, easy and very accurate. Once you have these two perpendiculars, it's a simple matter to draw in the rest of the grid. As they say in High School, that exercise is left to the reader. And that's how I drew my super accurate, totally level-to-the-face-of-the-earth lofting grids. 1. Don't mount your lofting board on the wall. I didn't have enough room on the floor for both the lofting board and the boat, so I thought I needed to mount the lofting board on the wall. But as future posts will illustrate, space is not a real problem. Loft on floor. By the time you start to put your boat together, you won't need the lofting board so much, and you can get it out of the way by leaning it against the wall. 2. Don't worry about making your lofting grid level with the surface of the earth... i.e., perfectly vertical stations, and perfectly horizontal L.W.L. Having a vertical lofting board planted this idea in my head, and I did manage to draw a perfectly level grid using the above methods, but as I later learned, this didn't help me in any way! The lines do need to be perpendicular to each other, but it doesn't matter a bit if they are level, gravity wise. In retrospect, that effort was a total waste of time. It might be easier to look to carpentry for help making perpendicular lines. 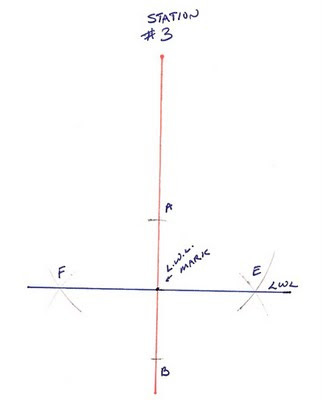 Create a straight baseline, then create a perpendicular line using 3-4-5 rule (Pythagoras). You can then measure off that line, to create your parallel line (stations). You're a great writer and I am really enjoying your blog. Good luck with the build! I still think this is too complicated. I have seen magnificent boats constructed by eye. All this accuracy is (in my humble opinion) overkill. I think boat building is more art than science and often close enough is good enough. But I am learning heaps. Where are you sailing these days? Last I heard, you were up in Alaska. You're the one with the interesting stories, I bet. Why don't you start a blog and share your experiences with us? I'd love to hear what you're doing. Wow! I made the blog. Amazing! Cool that your new boat will have as history the reuse of Burden Lake bluegill tackle. I have been using the tackle box my Dad gave me when I graduated from eighth grade in 1959. It is just more comfortable than those plastic boxes. It sits on a newly designed section of the aluminum boat. Well, "designed" is stretching it a bit. What I did was leave it upside down under the hundred year old pine during a huge December ice storm and large limbs redesigned it. I don't think the pine thought about spirit levels and certainly not plumb bobs or squares. But one of the enormous dents raises the floor of that part of the boat about six inches and so I can better reach the tackle in my tacklebox. Enjoying all your work and efforts and learning and the fine writing of it. Thanks for the blog.